Hilandar (Greek : Μονή Χιλανδαρίου, Serbian Cyrillic Хиландар, ) is an Orthodox monastery on Mount Athos in Greece, traditionally occupied and maintained by the Serbian Orthodox Church. 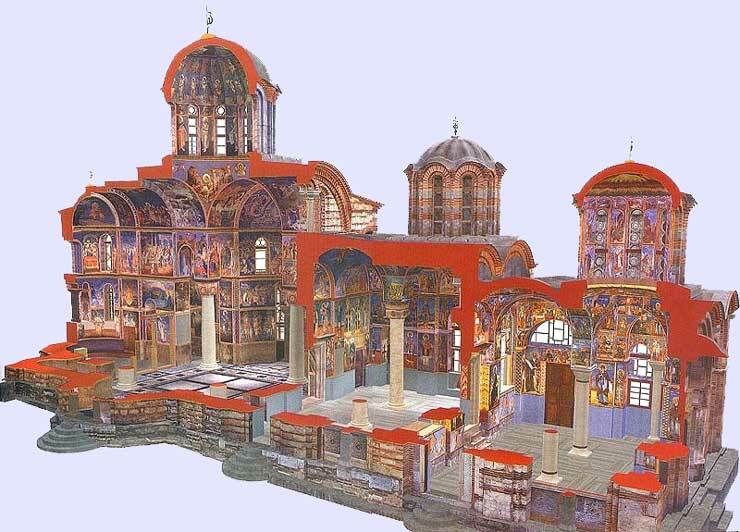 It was founded in 1198 by Saint Sava and his father Emperor Stefan Nemanja (Monk Simeon). 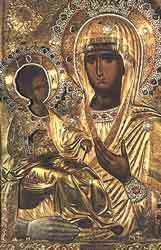 It was offered to the Serbs as "eternal gift"
Panagia Icon with the three hands. The monastery contains the icon of Panagia tricherousa (Παναγία Τριχερούσα), or "Panagia with the three hands" who according to a legend was able to glue the cutted hand of Ioannis Damaskinos (a punishment ordered by the regent of Damascus). Damaskinos offered then a silver hand model set next to the icon. 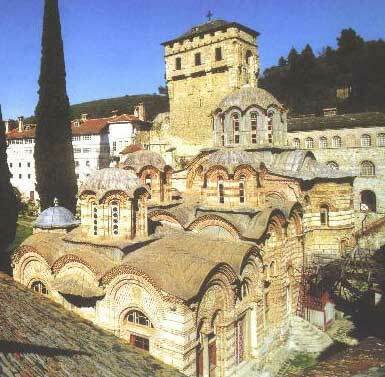 In 2004, there was a fire in the monastery that significantly damaged Hilandar. Chiliandarion is the most northern of the monasteries on the E. side of the peninsula. It is situated nearly a mile from the sea, in a vale watered by a torrent, and surrounded by pine-clad hills. The monks here are almost all Servians or Bulgarians, and a dialect of Slavonian is the only language spoken in the convent or used in the church service. Most of the monks are utterly ignorant of Greek. The name of this monastery is said (with little probability) to have been derived from its having been originally built for 1000 inmates. The library is not extensive, and consists entirely of Slavonian books. In the muniment- room of this, as of some of the other convents, are preserved very ancient and curious charters and deeds of gift from Greek emperors and princes of Servia and Bulgaria, as well as firmans, promising protection, &c., from successive Sultans and Viziers. The pile of buildings is very extensive and picturesque, and this convent is one of the highest in estimation and wealth of the whole number. The original founders were two Servian ascetics ; but the principal benefactor was Stephen; king of Servia, and son-in-law of the Emperor Romanus.